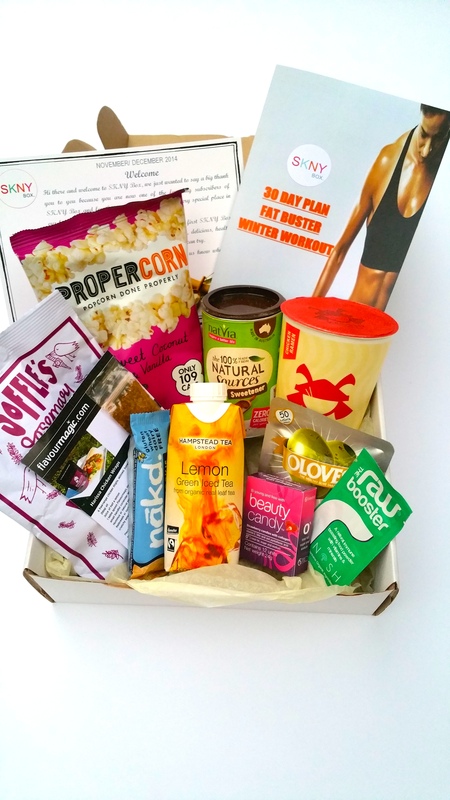 SKNY box – start a new healthy you in 2015! I was sent SKNY box for a review. I was taken by the idea straight away and agreed to review and share my thoughts. Couple of days later a beautiful box has arrived. The box was smelling really nice enticing me to it even before opening it. The box looked very inviting sealed with “Enjoy” sticker. When I opened the box everything was wrapped nicely and another “Enjoy” sticker was inviting to this new adventure. Inside this box was packed with healthy goodness. After taking a quick look, I was happy to admit that the timing could not be better. Now that my baby is 6 months old, I started thinking of beginning a little work-out and a healthy eating regime. This is exactly what SKNY box stands for! Oloves – olives with seasoning. So far this helped me to remember to be careful on what I am snacking in small hours after both of the children are finally in bed and I have time to drink my hot tea with some snack. I now take couple more minutes to chop up some fruits and vegs, I have houmous in my fridge and I love the Beetroot tzatziki recipe they have provided in a box. So why not to make a new resolution for a coming New Year 2015? Be Stronger, Knowledgeable New, You! This helps me feel better, thus making me a happier mum, wife, daughter, friend and a colleague. Due to breastfeeding I am still eating a lot! But I can now resist the temptation of going for a pack of crisps! And in four weeks I shed three kilos, it is not a lot, but it means a world to me! As I feel better in my body and I am back in my pre pregnancy jeans (well the stretchy ones). Box Plans are as follows which excludes £3 (Postage & Packaging) – this is added at checkout. This offer applies across all our plans so you can now grab a box from as little as £6.25 per month. Frankly at £6.25 this is worth a try! I recommend it and I am planning to buy this for couple of friends who have everything and like keeping healthy despite being time strapped. So make a good new year resolution and start a new healthy you in 2015! Our fellow editor of Mumsnet Merton arranged us a review of their local business’s product Carddies. We have received the package quickly and in time for a rainy weekend. And that exact weekend we had guests with eight children in the house, I was worried how to keep them all entertained. As their age range was from 6 months to 8 years. The hit of the day was this little box! It kept all the children entertained and us parents we could properly catch up. We have received our school set. 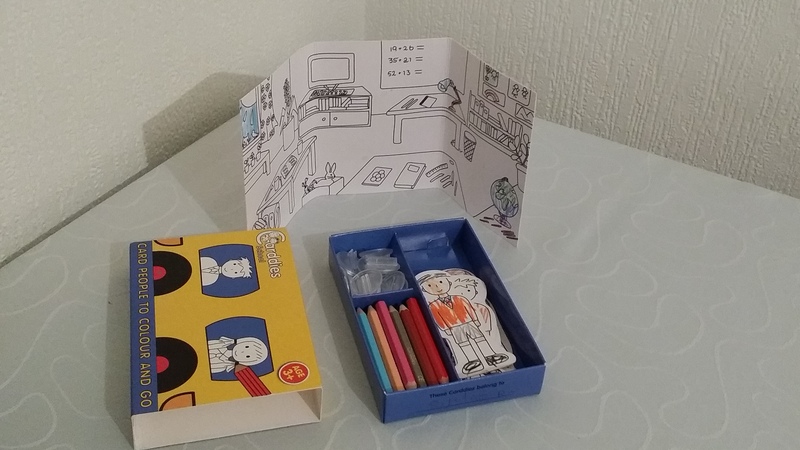 As the set arrived at the time children were at home, they were happy to open the package and started colouring in straight away. 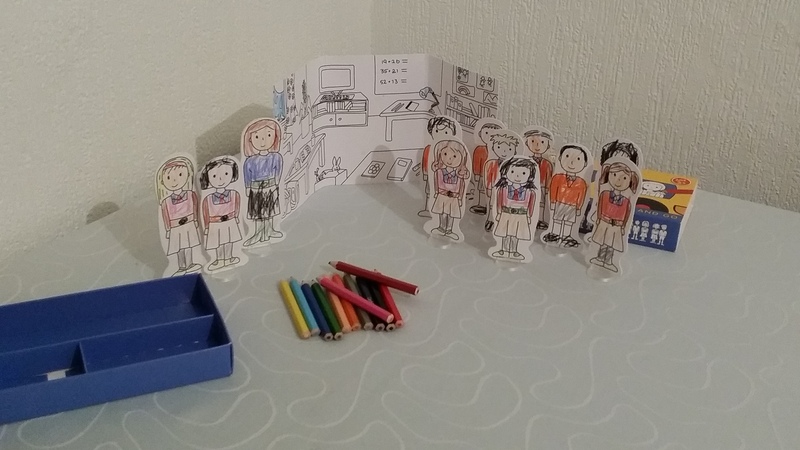 The set has 12 two sided people, a back drop, 12 art standard pencils and 12 stands. So these were enough to keep eight children busy. We thought they would be back in half an hour with dared “I am bored” claims, but no, we did not hear from them all day long! I truly love this product. My five year old has been playing with them again and again. After each play she stores them all carefully in the box, making sure she hasn’t lost anything. It is rare to see her storing her toys this way. It shows her willingness to play with them again and again. And at RRP £8.99 I think we can get her more when her reward chart is shining with stars. A little bit more info on Carddies products. The company has been set up by sisters. This is truly British Ecofriendly product and they try hard to keep the production in UK. 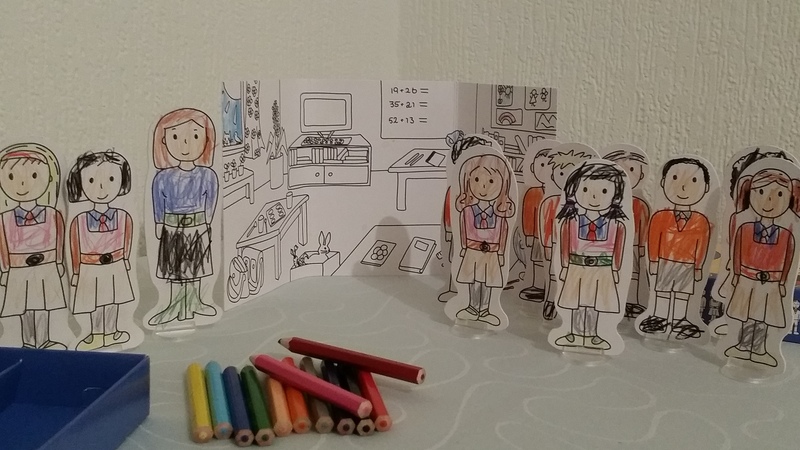 Carddies, the Card People to Colour and Go, were launched in January 2012. With a collection of 12 sets including Carddies London, Sports, School, Fairies, Cavemen, Football, Ballet, Knights, Family One and Two, Farm and Nativity, Carddies suits both girls and boys aged 3 to 10. Perfect for families on the go, this portable toy includes 12 colouring pencils, 12 figures with stands and a backdrop, all included in a sliding box. The toy is self-contained, highly portable and made from premium card: perfect for keeping children amused on any journey or outing. The product has gained numerous awards. Save 20% when you purchase 4 or more Carddies sets. To receive this discount enter code XMASOFFR in the “Gift Card and Promotional Codes” box at the checkout when placing your next order from the Carddies own store at Amazon. (Postage is payable to Amazon under their usual terms and conditions (a minimum total spend of £10 is required for Free Super Saver delivery). 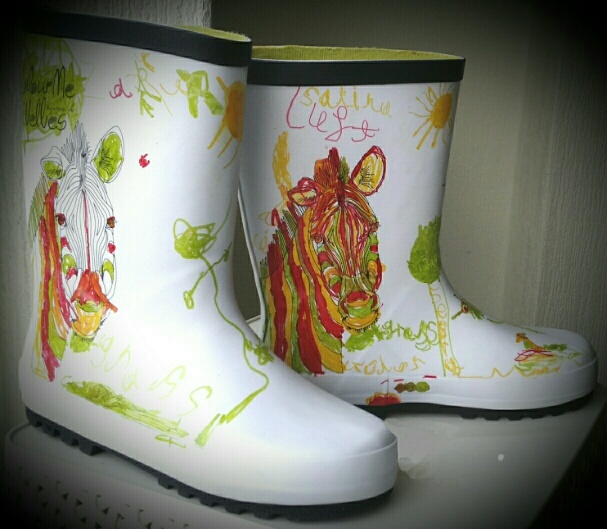 Let your child personalise their wellies! Yes, you read it right! 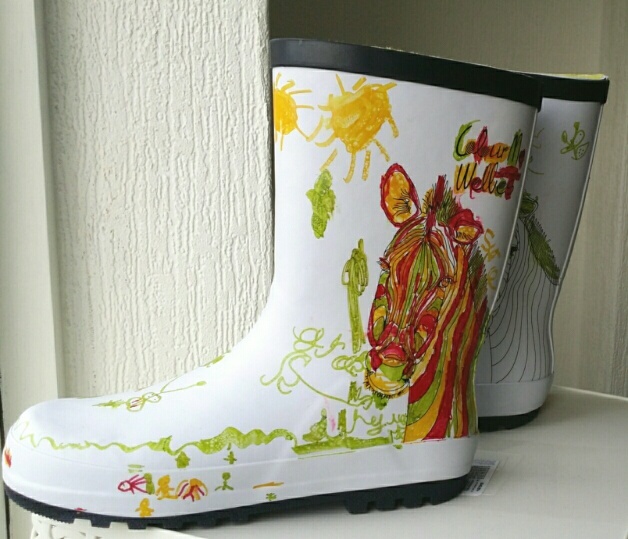 Now your children can personalise their own wellies! Bournemouth based company el RHEY offered us to review their lovely product, we agreed to do it with pleasure! Come on colour in wellies! What a great idea! The package arrived the next day. This shows how quick and efficient they are. I impatiently waited my five year old to come from school, so that we can open it together. Hearing her squealing whilst opening and seeing her this excited made me happy. 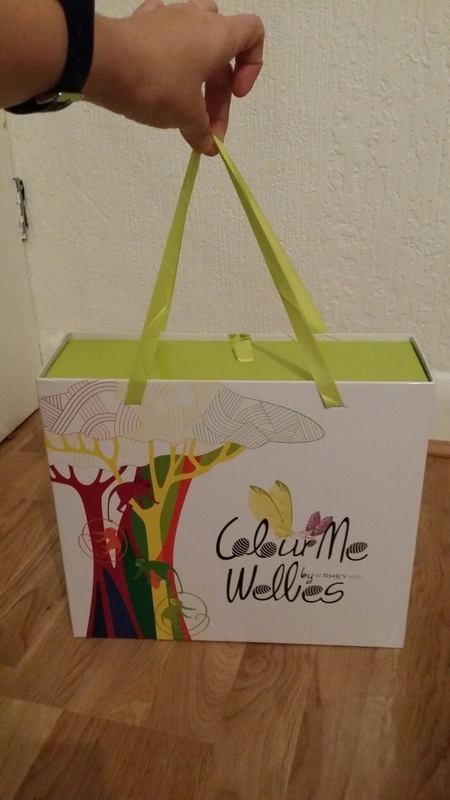 It was beautifully packaged and a Zebra gift pack or Moth Gift Pack would make any child happy. It comes in a gift bag and a box slides out smoothly. My daughter liked this packaging and she is keeping it for her role play. 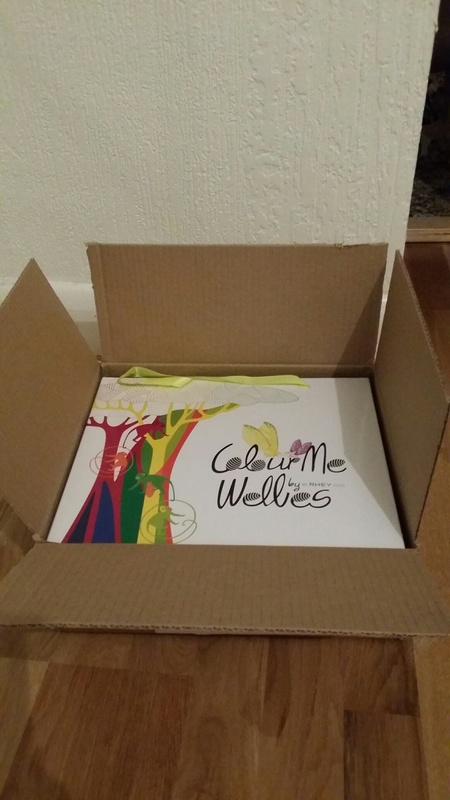 She read the book it comes with and started colouring her wellies right away. It is amazing to see where the child’s imagination takes them. She also wrote down right and left on them, so that when she is putting them on she would not confuse them. She put her name on them making sure they are as personal as can be. Watching her I was thanking el Rhey for their brilliant product. As a mother I know a child likes to put their signature everywhere, be it on the walls, on their hands and legs and more. This product finally lets them do what they like and to show their chef d’oevre to the world. My daughter put three suns on hers, made sure her giraffe has plenty of grass, the flora, the fauna and she even drew deep sea creatures! Now her wellies have their own story, which she is proud to tell. She says it is still work in progress. I am amazed at how much time and consentration she is putting into this. Being a normal five year old usually she does not have much patience.Staying within the lines while colouring was not for her. She would just scribble over the image and leave it like that. I tried to explain her again and again that it would be better if she stayed between the lines and colour in each part of the picture. But she ignored this until el Rhey wellies. I was pleasantly surprised to see her carefully colouring in each section and thinking the whole scene beforehand and than colouring it in. 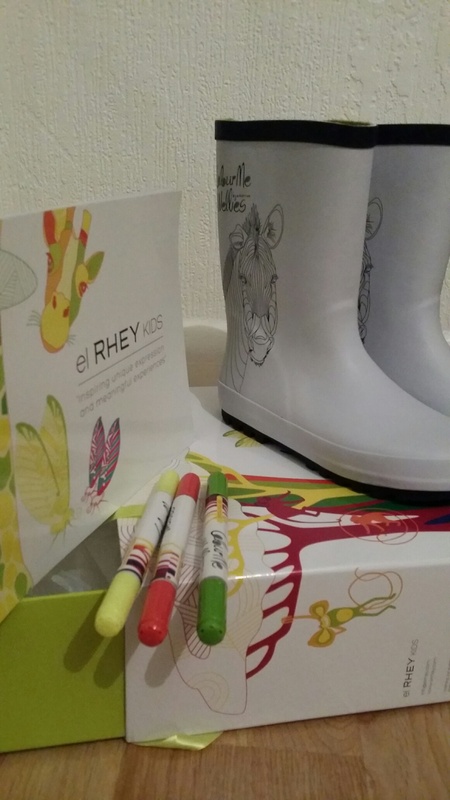 But these wellies proved if the product is right even most of the energetic child would sit and create his/her work of art. Because this is one of the rare occasions they are allowed to let their imagination create a personalised item they love. So for us this was another benchmark of her skills development. And I think at £25 this gift pack is an excellent present for those children who have it all. At a saturated market it is not easy to find something meaningful and stands out. These wellies get all five stars for us! And we now recommend this product to friends and families, who complain they do not know what to get a child. So go get them and make your a child’s present lasting and meaningful! 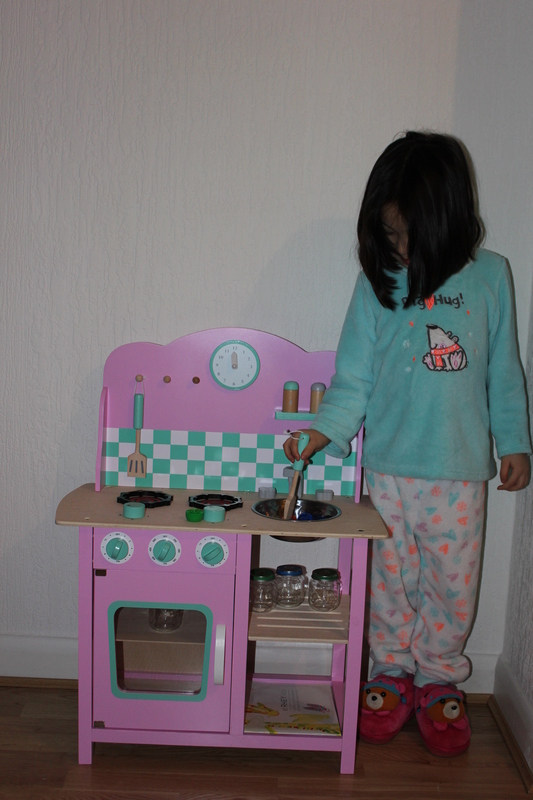 I was offered to review the Great Little Trading company’s Portabello Kitchen. The kitchen arrived flat packed and I think it would be perfect to wrap up as a present and to send over the post. My girls were asleep and my husband was excited to take his tools out to assemble the kitchen. It took him 1h30 minutes (with tea brakes of course) to assemble the whole thing. He said that it was thought through and the only part he found fiddly was to put the oven door on as the screws were really tiny and I think he used a bicycle tool to screw it in. In the morning girls were excited to see a brand new toy in the house, as their old plastic kitchen was left in a skip while we were moving. My elder daughter started cooking us breakfast right away, while waiting for hers. Let me first say why do I like this play kitchen. My five year old loved it straight away and she brought the empty baby food jars to play with in her new Portobello play kitchen. She really liked that when you turn on the hob you can hear the sound and that the oven door is see through for a change – “just like a real oven” she exclaimed! She now uses the clock to show us what type of meal she is cooking be it a breakfast or a lunch or even a dinner. She is quite a fussy eater and if there is a hint of pepper or a little bit more salt she would not eat at all. Now having a kitchen with salt and pepper set she started to venture further in the land of different tastes. As when she said she did not want the food with pepper in a restaurant, I reminded her that she puts pepper in the food she cooks in her kitchen! That solved us a problem and constant asking not to put salt or pepper in her food, which always sneaked their way through to her plate before. She is trying to engage in this role play her baby sister now. I am glad this play kitchen helps them bond more. The 6 month old likes to hold onto the play kitchen and to stand for a little while. Under our control she holds onto it and luckily this kitchen doesn’t topple. The other bonus is that this kitchen doesn’t have any sharp edges and overall has a beautiful shape. Hence we left it downstairs where our baby crawls around. The sink also doubles as a bowl and she can easily take it and play with it. She brings us the food she cooked in it. My 6 months old baby likes to turn this bowl and to bang on it with the wooden utensils the kitchen comes. As it is metal it is quite sturdy. She tried to chew on it on several occasions, but I did not let her do it as the metal is quite hard against her gums. But she likes to bite on ustensils. I think in a month or so she will start playing with the oven door. As it is quite a good height for a sitting baby to open and close and put things inside (or to take out). I am thinking of doing little explore baskets and putting them in there, so she can “find” them herself and have fun exploring different textures. The tap on the kitchen moves to the side, as the real tap you can turn it to the right or to the left. The wooden levers can be turned too. 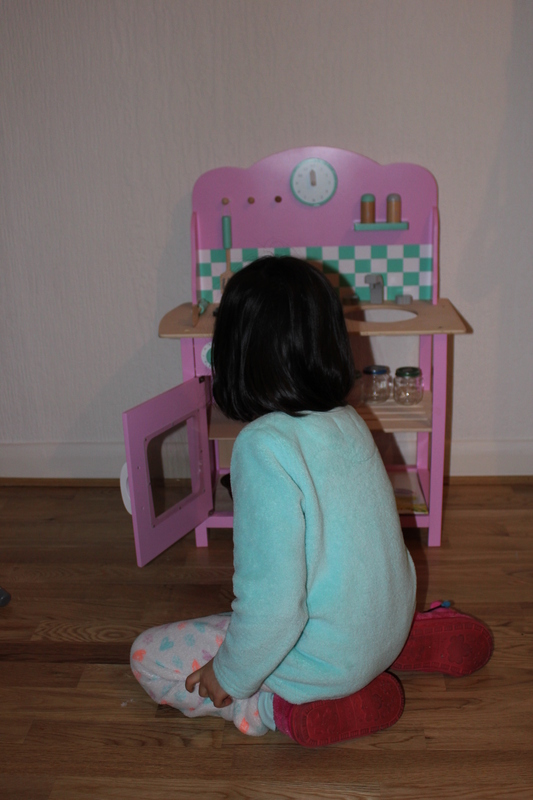 My five year old likes the fact that this kitchen has shelves and is asking for more wooden kitchen toys to accompany this kitchen. We think “Let’s play House pots & pans set” will be a perfect addition to this kitchen. Lily rose tea party set will be for when she has friends over too. Now let us talk about the shortcomings (there are not much, but I wanted to give my honest opinion). We would like these play kitchens in more colours. When choosing the colour my five year old went for this one as it had duck egg blue “Disney Frozen colour” in it. As I have stated above the oven’s plastic mirror’s screws are really small. So make sure you do not have kids around when you are assembling this kitchen. I found the kitchen a little on a small side. It states it is for three and over and it was perfect size for a three year old guest though. I would buy this in a sale price£66.50, but may be not £95. 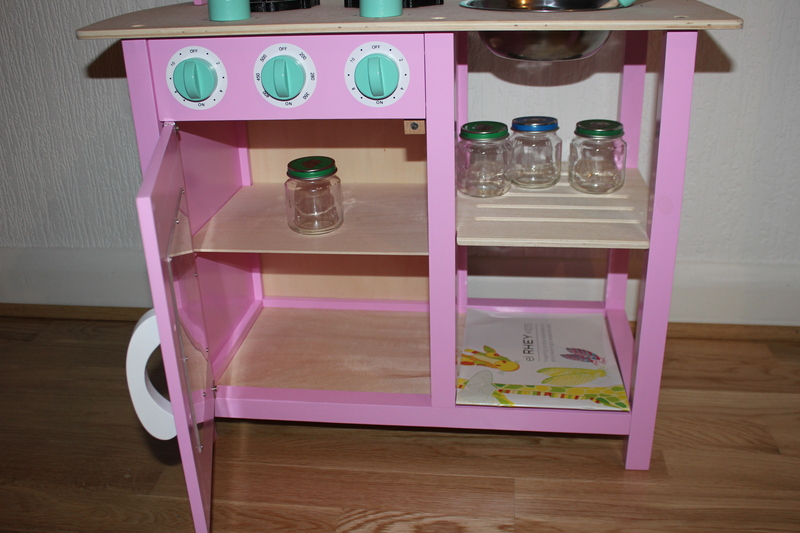 You see, there are not much shortcomings to this play kitchen. We have been using it nearly a month and it is standing strong. We had guests and eight children in the house from 6 months to 8 years. I thought only three year old ones would play with it and I was wrong. To our surprise they all liked to play with it, both boys and girls. So this quality product would make a perfect gift to keep the children and their friends away from TV and enjoying a role play in stead. Who knows, may be this will help shape future celebrity chefs. A day in the life of a handyman: 40% Fitting and Fixing, 10% fighting congestion, 50% building relationships. Silver Saints is London’s premier handyman service. We consider our team of multi-skilled handymen to be the best of the best. To be a successful London handyman you firstly have to be a natural problem solver. The solutions your offer needs to be backed up by technical knowledge and practical experience. But this only accounts for 40% of the day to day role of a London handyman. A further 10% of a handyman’s day is made up of fighting congestion, finding parking and dodging traffic wardens. The remaining 50% of been a successful professional London handyman is about building relationships. Good tradesmen have always known that the secret to keeping busy is repeat custom and word of mouth referral. To achieve this holy grail of marketing does take constant effort but at the end of the day earning a customer for life is about building a trust relationship with that customer. We as consumers are constantly bombarded by media reports of ‘rip off Britain’ and ‘cowboy tradesmen’ which has made most of us both cynical and sceptical about tradesmen in general. So when a handyman arrives at the door of any customer the challenge before him is not only to solve all the problems on their ‘to do’ list but also to win their trust. Be punctual– the appointment time is our first promise to a customer. Keep that promise and a handyman is already on his way to winning the customer over. Break this first promise and he is already fighting an uphill battle. Be presentable– a professional handyman looks like someone a customer wants to invite into their house or office and not like someone who has just walked off a construction site. Be friendly– The handyman is entering a customer’s home or work place. His disposition should be warm & friendly. He should adopt a flexible, can-do attitude but at the same time should always keep his repertoire professional. Clear communication is key– this is arguably the most valuable tool in a London handyman’s tool box. The ability to clearly communicate the options, costs and outcomes to customers of varying technical knowledge is a critical skill for a professional handyman to have. Interests– a good handyman will always put the customer’s interests ahead of his own. Having the knowledge and confidence that customers value having their interests been put first and ultimately the handyman’s own interests are best served by repeat business. Charge fairly– so many hard earned relationships are broken down over money. A professional handyman is upfront and transparent about all the charges. He gives a clear indication of costs before he starts the work and can account for all labour and materials charges. Keep promises– A big part of trust is dependability. A good handyman follows through on promises he makes to customers. If he says he will source a part and return to fit it he will. If he says he will prepare a quote for further work he does. Been able to stick to these principals in the face of complex problems, sometimes challenging customers and the hustle bustle of riding around London on two wheels is the balance that a successful mobile London handyman has to master.